The blessing of the victorious God, the risen Christ, and the resurrecting Spirit is upon us. Amen. It is with strong joy and holy fanfare that we gather to celebrate the Resurrection of Jesus Christ. On behalf of our church staff, our vestry, and the entire St. Paul’s community, I extend a radical welcome to everyone here this morning. in a long time. In this sacred space you are guaranteed that God loves you just as you are. You may be aware that not only is today Easter; it is also April Fools’ Day, a coincidence that has happened only four times in the last 100 years. It’s origin lies in the switch from the Julian to the Gregorian Calendar in the 1500’s, making the start of the new year January 1 instead of the previous date of April 1. Those who ignored the change and celebrated New Year’s on the wrong date were labeled as “April Fools.” The practice of playing pranks and telling jokes eventually found its way into the mix. Given that we’re in the throes of tax season, I’ll share one with you. 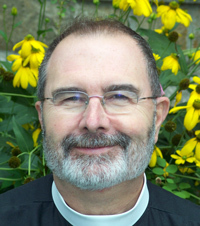 The Rector of St. Alban’s Episcopal answered the phone one morning. “Hello, is this Father Moore?” said the voice on the other end. This could be a true story, couldn’t it? It’s entirely believable. The familiar story we have come to hear today, the amazing story we are here to celebrate is not so believable. Unusual pairing we have: a rising from the dead and a day to be wary of. In some respects, the Resurrection seems like an April Fools’ joke—God’s ultimate joke on death. It is a challenge for our human brains. Why would we believe that someone who was crucified and died and buried could come to life again? They say Jesus predicted it on many occasions but who could believe such a thing? The disciples at first probably though he was fooling. There were no witnesses to this experience, just an empty tomb and the disheveled burial cloths tossed aside. All we have is the story told by Gospel writers Matthew, Mark, Luke and John and passed on to us through the centuries. What exactly happened that morning in first century Jerusalem? Let’s look at it from the perspective of Mary Magdalen, the first person to arrive at the tomb of Jesus. The fact that she was there in the pre-dawn darkness is pretty amazing. It had been a violent week in Jerusalem and she had seen what was done to Jesus. She was there to the bitter end. What might the authorities do to her and his other followers? And what might people say about a single woman being there all alone? She lived in a sexist, even misogynistic society. What was this foolish woman doing ignoring danger and acting so aggressively just to be close to the dead Jesus? None of that mattered to her. Mary was determined. She went because of her deep affection for Jesus and for what he had done to raise her up. At the tomb she wept with tears of grief until she heard a familiar voice. It was Jesus. Unlike the men who saw the empty tomb and ran back to their home, either in fear or excitement or both, Mary lingers a bit. She stays and encounters the risen Christ. Today we hear her dramatic testimony of that Easter morning, full of confusion and fear but also bursting with joy and glorious recognition. Some of you know that this church was once dying. When I arrived in 1993, attendance was way down and the future looked very bleak. St. Paul’s had lost a lot of members in the years prior to my arrival and there was a lot of conflict. By God’s grace, the faithfulness of those still here, and a lot of hard work things changed and we emerged from the tomb to be the vibrant, awesome, radically welcoming place we’ve become. Maybe that is all Jesus really asks of us. You may be greeting this Easter morning with great enthusiasm as you hear the proclamation, “Christ is risen!” or you may have your doubts as even his disciples did. Maybe all you need to do is just to be here. And you are. We may come today with strong conviction and faith. We may have a lot of questions and doubts. We may vacillate back and forth between those two states. Even some of his disciples had doubts. Jesus never troubled himself about that nor did he tell us to argue disbelieving people into belief in his resurrection. He sent his followers out to be his presence in the world and to bring the Gospel of love, forgiveness, and healing to all. That you’ve come today and stayed means that you have put yourself in a great place for the Risen Christ to reach out to you. He continues to engage each of us as he engaged Mary Magdalen—to speak our name and to touch our hearts with comfort, peace and the assurance that we are not alone and that we are loved. We may wonder about the experience of resurrection and yet we are all familiar with the experience of the tomb as it manifests in the brokenness, sadness, loss, disappointment, betrayal, and rejection we may have experienced in our life. Poverty, addiction, prejudice, violence, and injustice can all lead people into the tomb. I suspect that many of us have had our own share of “small symbolic deaths” and know that deep sense of longing to be raised up from them. Resurrection did not happen just once on a morning in Jerusalem two thousand years ago. It is a continuous God-driven experience. The story is told of a conversation between a member of Trinity Church, Santa Barbara and the then retired Episcopal Bishop, Daniel Corrigan, whose stirring preaching and passionate commitment to social justice pushed Christians to enact God’s compassion toward the oppressed and the outcast. No joke. No fooling. Jesus is alive and with us still. For all eternity. Alleluia!